I purchased a 29' (9 meter) light duty television tower 4 years ago soon after I returned to the hobby. After starting off using house eaves trough for an antenna I wanted something better since it seemed I wasn't going to wander away from amateur radio for another 20 years. At first the tower was deployed as a guyed tower supporting a multi-band dipole and a 40 meter delta loop. When I replaced that with a stronger tower suitable for a rotatable yagi I bracketed the small tower to the house, installed a tall mast onto it and used that to support a fan dipole. A small tower such as this is not part of my current more ambitious antenna farm planning. Even so the tower is up once again. Again it is bracketed to the house. Its intended use is LTE terrestrial wireless internet access. My current obsolete wireless service was a special order so that I could get connected quickly when I moved in last fall. The ISP wants to move me to the new, faster service and I am eager to oblige. So while not a tower for amateur radio purposes I thought it might be of interest to any readers who want to press one of these inexpensive light duty towers into use to see how I did it. Bracketing a tower to a building, while convenient, must be properly done to avoid compromising the tower, personal safety and the structure of the building. This particular tower -- Golden Nugget -- is very common in Canada. Other countries have similar products on the market. This tower has three 10' sections (top section is 9' 6") made from 1" OD 18 gauge tubular steel pipes and horizontal cross members of formed sheet metal. The welds are a bronze-gold colour, hence the name. Load capacity is modest, perhaps 2 ft² when bracketed no more than 10' (3 meters) below the top. A flat plate with flanges is designed for ground mounting the tower. The flanges bolt to the bottom section and holes in the plate are meant for driving stakes into the soil. I prefer a more engineered base so I fashioned one out of 4x4 preserved wood. I kept the one I had previously built. I just had a garage built next to the house, which was my cue to begin the grading/drainage work between the buildings, including setting the new grade and then the base for this tower. Until now I wasn't quite sure at what level to set the base. Without considering other factors the ideal location for a bracketed tower is where the bracket can be placed at the maximum height. On a typical bungalow this would centred on one the side of the house with the bracket nestled near the roof ridge. There are more options on a two-story house since many points allow bracketing quite high. Of course there are other factors. One is aesthetics and another is safety. My previous house allowed for several options with some being unsightly and others not allowing good placement of antennas (e.g. near the property edge). On my current dwelling there is really only one good place for the tower even though it is not the best for bracket height. All the higher options are in front of large windows or in the middle of a deck or balcony. However my chosen location is not bad, allowing the bracket to be just under 16' (5 meters) above grade, which is more than halfway up. Since the only antenna will be a compact dish I do not have to worry about where HF wire antennas would go. This is good since the roof of the house is steel, which is less than ideal for HF purposes. To be effective the brackets must tie into the frame of the house. On a typical North American wood frame house this is usually not a problem, if one is careful. Unfortunately from the outside it is not always clear where the studs, headers and trusses are located. Being a country house with a deliberately rustic design the exterior is clad with batten board and striping. There are no indications on close inspection of where the frame members are located. However I do know that the frame is sheathed with chip board, on top of which are wood straps to which the cladding is nailed. None of those is acceptable for a tower bracket since they offer little resistance to tension. The fascia is no better. Typical attachment of wood fascia is nailing into the ends of rafters or, in this case, short studs that bridge the distance from the outermost truss to provide an overhang. Again, those nails offer little tensile strength. Worse, the fascia and soffit block access to the top of the truss, which would be a good anchor for the bracket. Peeking through the screened attic vent told me little. Other than a lumber frame around the vent (not a good choice for bracketing!) I could see little. The house blueprints only provided generalities not specifics of how the wall was constructed. Density meters for locating studs, pipes and wires are inadequate to locate framing from the exterior. When my previous house was built I took lots of pictures (film, remember that?) of the house framing before the insulation and drywall were installed so I knew where everything was located. I only needed to take some measurements, compare to the pictures and I could find suitable anchor points to within an inch. But for this house I needed to see inside. Before purchasing the house neither I nor the inspector I hired could find an access to the attic over the bedroom wing; the rest of the house is post and beam with a cathedral ceiling so there is no attic except here. I puzzled this one through, periodically looking up as a walked around the house. That's when I spotted someone odd about the overhang in front of the house. I had one of those "aha!" moments. Minutes later with a ladder and a few tools I was in. I took pictures of what I could see of the wall I'd selected. Coincidentally we are looking directly across the roof of the shack. 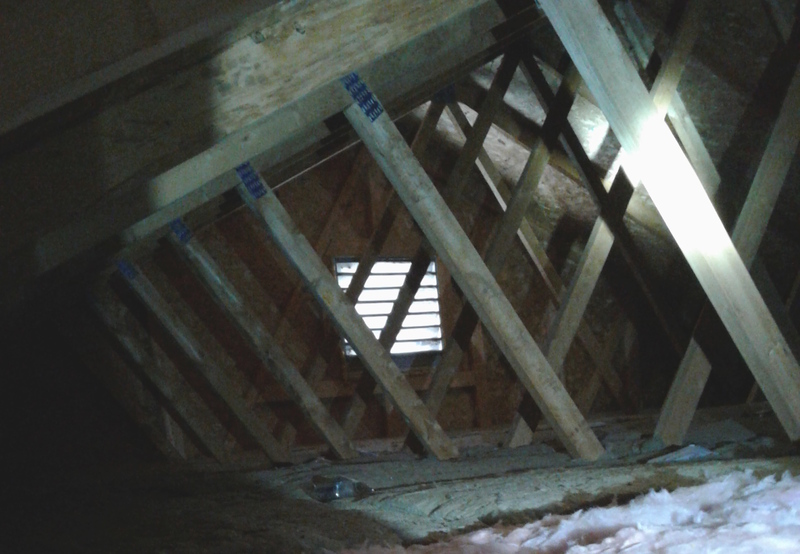 I did not enter the attic since quite a lot of care is needed to cross the rafters in a modern house with engineered trusses and heavy insulation that buries all the structural bits. I've done it when necessary, and I can assure you it isn't much fun. It is very easy to damage the ceiling, and yourself. However all I needed was the picture. All that needed to do the rest is one measurement from the outside to calibrate the scale of the picture. For me that was the width of the vent frame: 24". From that I could determine the location and size of all the dimension lumber and how it all ties together. I chose the 2x6 header over the vent frame for the bracket anchor. It provides a wide solid support for long lag bolts and it is suitable tied into the end truss. The sheathing, though weak on its own, adds to the lumber connections so that tower loads are distributed over the framing. For a larger tower with an HF yagi I would not recommend this choice. For my internet dish or for wire HF antennas or a small VHF yagi this anchor is perfect. If you are going to go big with a bracketed tower I suggest you either hire an engineer or find a more secure anchor in the frame. On my previous house I was able to anchor into two layers of 2x6 header sandwiched between the rafter of the trusses and the exterior 2x6 support walls. That will take substantially more load than what I have selected here. I kept all the hardware used to bracket the tower to my previous house. Some is custom and some is specifically made for bracketing a small tower. 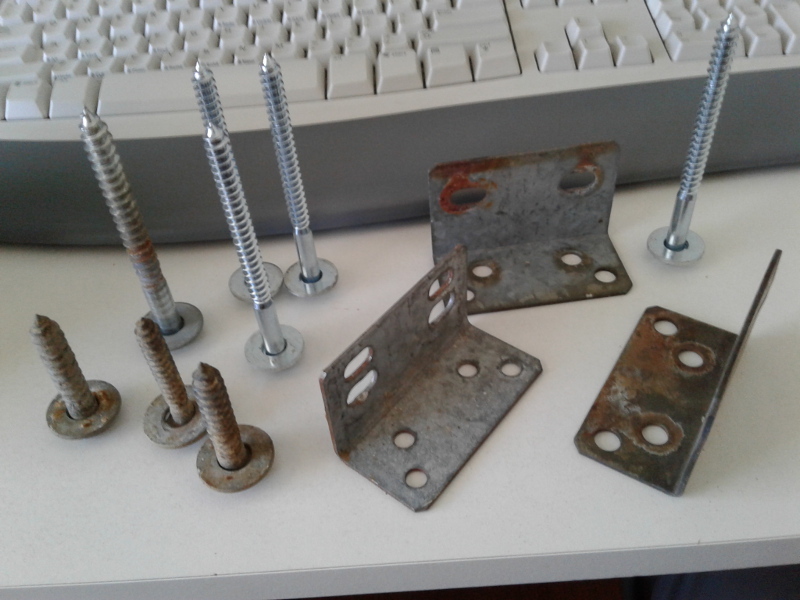 In the picture below is pretty much all that I needed, other than the hardware store perforated angle steel I use to make the bracket arms and the U-bolts to attach the arms to the tower legs. The L-brackets are attached with lag bolts to the house (upper flange) and with grade 5 bolts to the arms (lower flange). I picked the two in the best condition. These L-brackets are sufficient high grade to resist bending under load or under bolt torque. I chose to use 5/16" lag bolts rather than anything larger since the tower load is small. The shorter bolts secure the base plate to my homemade preserved wood base. With a little geometry I calculated the required distance between the L-brackets to that when positioned the tower faces would align with them. As it turns out I made an error during measurement and they were 1" off. Thus one of the bracket arms wasn't flat against the tower face. This is not a serious problem so I didn't bother moving the L-brackets, and avoided repairing unwanted holes in the siding. 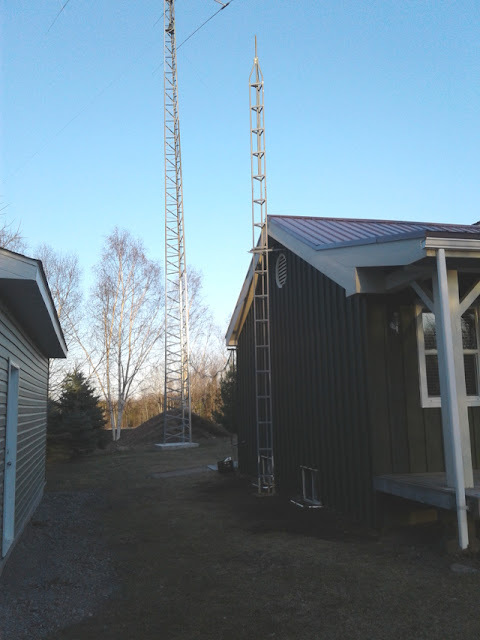 Several hours during a warm spring day was all it took to attach all the hardware and raise the tower. It helps to have a friend although I did this job on my own. The L-brackets went into the header just as planned. In one case when drilling the bolt holes there was the expected gap between exterior board and sheathing, while in the other I got lucky and hit the wood strapping between those layers. In the latter case this permitted me to torque the lag bolts without undue concern. The other required me to not tighten the bolts too much since that would only bend and possibly break the exterior cladding board. 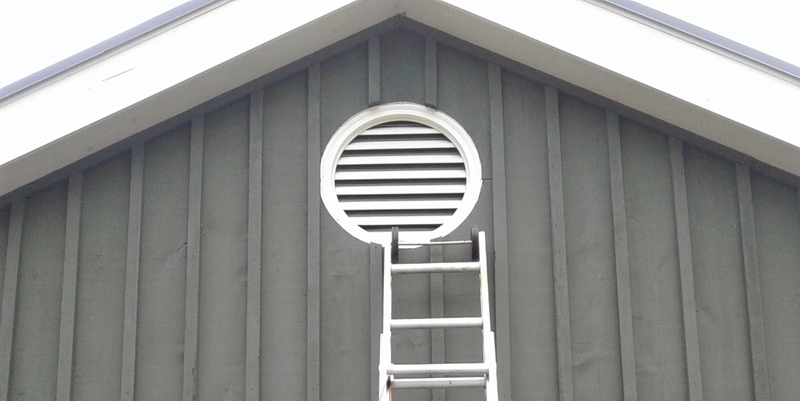 It is important that the holes through the intermediate layers permit the lag bolts to slip through; the threads should not bite into the siding or sheathing. Collars are available for lag bolts to allow the bolt to take full torque without bending the cladding. This requires carefully drilling a hole for the collar or it will sit too deep or too high and not do the intended job. I didn't bother with collars, even though I have them in my stock of parts. The full length hole is smaller so that the lag bolt threads engage the frame lumber. Although you skip this hole, drilling a hole reduces the chance of splitting the wood and thus compromising the strength of the bracket. For my 5/16" lag bolts I used a 3/16" drill bit. With the L-brackets installed I sat the bottom tower section on the wood platform and weighed it down with stones (I have plenty on my property!). From the ladder I lifted the next section and dropped it in place. Bungie cords, one per L-bracket temporarily hold the 20' of tower upright. The small sledgehammer and scrap wood you can see were needed to press the section into place since the legs were slightly ovalized. They are easily deformed when tightening the splice bolts. Separating sections can be difficult if the installer was over-enthusiastic with the wrench. The next step was to attach the bracket arms to the L-bracket and tower legs. If you don't have the manufacturer's bracket arms you can fashion your own, as I did, from galvanized or painted steel of suitable strength. If this makes you uncomfortable I strongly recommend you only use the purpose-designed brackets from the tower manufacturer. The previous owner of this tower fabricated his own bracket arms. Although they were very poor strength the tower survived for years. I rejected them. With the brackets holding the tower the bungies were removed and the tower made vertical with a long level. Only then is the base plate bolted to the wood base. To lift the top section I opted to reassemble my old light duty gin pole that I had built for raising DMX tower sections. The brackets I made fit the Golden Nugget reasonably well but require securing the gin pole to the tower since with horizontal cross member the gin pole can easily slide. Although the tower sections are light I strongly recommend a gin pole since it is harder than you might guess to lift a 10' section above you, holding it perfectly vertical, aligning all 3 legs at the same time and pushing it down into place. I know some rare individuals with the physical gifts to do it, however I am not one of them and it is almost certain that neither are you. The mast is easy enough to raise and slip into place without a gin pole, if you are careful to keep it nicely vertical during the procedure. Surprisingly little deviation is enough for gravity to twist it out of your grip and cause injury to you and your house. Don't hesitate to ask for help if you need it. As the sun set the tower was complete and the tools and materials put away. Now I have only to inform my friendly neighbourhood ISP to visit at their convenience to install their equipment and upgrade my wireless internet service.